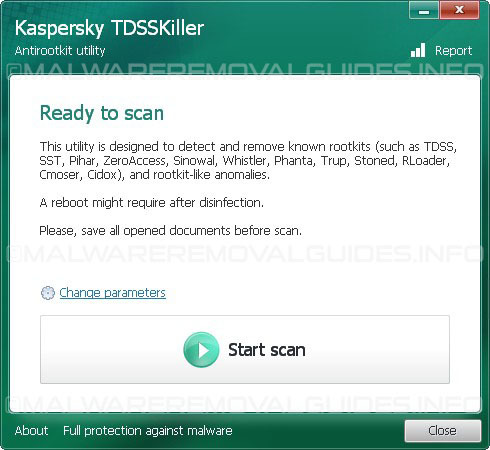 TDSSKiller is a malware removal tool created by Kaspersky Labs that is developed especially to remove the TDSS rootkit. This rootkit is know under other names such as Rootkit.Win32.TDSS, Tidserv, TDSServ, and Alureon. 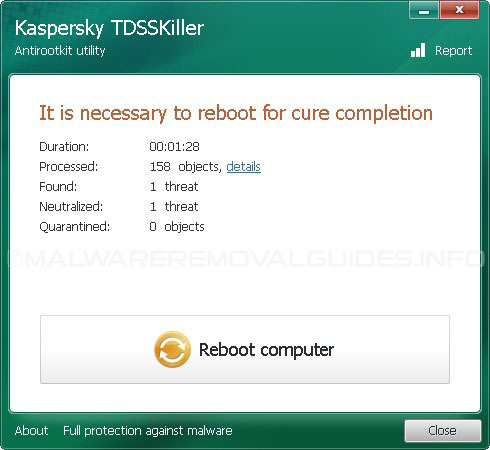 TDSSKiller will also attempt to remove other rootkits such as the ZeroAccess rootkit and replace infected files like services.exe. 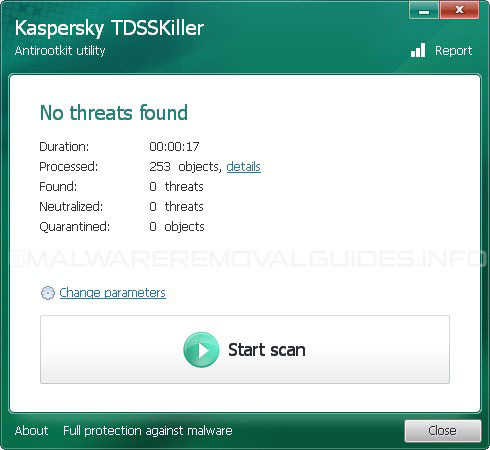 Kasperksy TDSSKiller can be downloaded as an stand-alone executable or a ZIP file that contains the executable. When using the program, it is easier to download the EXE directly and only download the ZIP file if your computer software or Internet connection does not allow the direct download of executables. Do not use the computer during the scan! Please reboot immediately if it states that one is needed. Whether an infection is found or not, a log file should already be created on your C: drive ( or whatever drive you boot from) in the root folder named something like TDSSKiller.2.1.1_27.12.2009_14.17.04_log.txt which is based on the program version # and date and time run. -l – Save the TDSSKiller to log to the specified file name. If you do not specify a full pathname, TDSSKiller will save the log in the same folder that the executable resides in. -qpath – Specify the path to a folder that TDSSKiller should use as the Quarantine folder. If this folder does not exist, TDSSKiller will create it. -qcsvc – Copy the specified service to the quarantine folder. -dcsvc – Delete the specified service. Only use if your sure the service should be removed.